Our patented VectorWall™ mixing checkerwall increases capacity and lowers the operation and maintenance costs of medium and large diameter high temperature reaction furnaces such as those used in Claus Sulfur Recovery Units (SRUs). This is accomplished by altering the reactant flow path, creating significant mixing within the chamber thereby optimizing use of the available volume within the chamber. VectorWall employs Blasch’s patented HexWall™ technology as a stable and reliable foundation for use even in oxygen enriched environments. VectorWall checkerwall can be configured for a variety of new flow regimes including tangential vortex flow. The benefits of the VectorWall mixing checkerwall lie in its mechanical stability and its infinitely variable mixing configurations. These configurations may be adapted to provide optimal mixing regardless of burner types and locations. And they are simple to erect, reducing the need for expensive, highly skilled labor. VectorWall is a cost effective way to achieve significant enhancements in conversion rate. The vast majority of refractory, by volume, used in the refining and petrochemical sectors is in the form of brick or castable. These allow for the greatest flexibility in installation, but greatly limit the ability to develop innovative component and assembly designs that work to the inherent strengths of refractory materials, which can, in turn, provide significant process improvement. One such example is the use of a checkerwall in reaction furnaces to improve various process parameters. If you are interested in not only saving time on your next turnaround, but improving your process as well, download “Rethinking Refractory Design” to find out more. Learn the science behind VectorWall and how it improves your reaction furnace efficiency. Improve reaction furnace efficiency and process throughput with VectorWall. See how easily VectorWall can be installed, saving time and money. Download more information on our VectorWall mixing checkerwalls. In the January/February issue of Sulfur Magazine, J. Bolebruch of Blasch Precision Ceramics, B. Lamb of MECS and M.D. Harris of J.T. 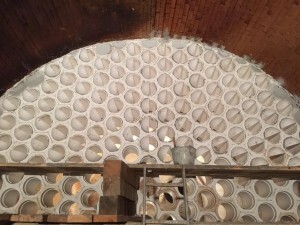 Thorpe & Son, report on the successful recent spent acid furnace upgrade in which HexWall™ ceramic furnace internals enabled DuPont Burnside to conduct a complete furnace replacement in a matter of days. In this case study, we outline steps taken to engineer a solution to address the repeated mechanical failures of a traditional combustion chamber checker wall, occurring in Tessenderlo Kerley's Claus sulfur recovery unit.